Pregnant patients may experience nonobstetrical emergencies over the course of their pregnancy, including appendicitis, renal colic, ovarian torsion, hemorrhagic ovarian cysts, trauma, and pulmonary embolism. The utilization of computed tomography (CT) in the diagnosis of diseases such as these has increased in recent years, and the same trend is observed in pregnant women.1 Ionizing radiation is a carcinogen and the increased utilization of CT has been cited as a potential cause for an increase in the prevalence of cancer in developed countries.2-4 When CT is performed in pregnancy, there is also concern about the teratogenic and carcinogenic effects of ionizing radiation to the developing fetus. In this review article, we will discuss the role of CT in diagnosing nonobstetrical emergency conditions in pregnancy and the risks and benefits to the mother and fetus. For simplicity, we will refer to the conceptus as the fetus. More precisely, the fetus refers to the conceptus after 13 weeks gestational age and the embryo refers to the conceptus before 13 weeks gestational age. The safest imaging test in pregnancy is ultrasound. It has no known adverse effects on the mother or fetus. It is the first-line imaging test in pregnant patients where applicable. Plain films result in negligible dose to the fetus when the fetus is not in the field of view. It is recommended that a radiation shield be applied over the gravid uterus for these examinations. Studies through the gravid uterus, such as radiographs of the abdomen and lumbar spine, result in a fetal dose of 1 mGy to 3.5 mGy.5,6 The background radiation dose to the fetus for 9 months of pregnancy is 0.5 to 1 mGy6 (Table 1). CT focuses a collimated beam of x-rays on the body part of interest. 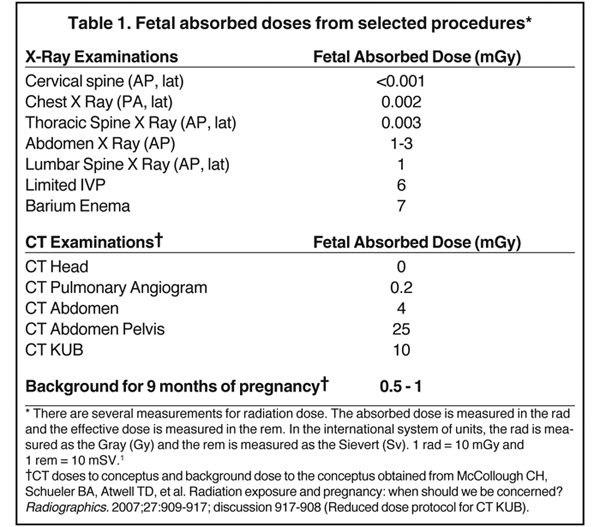 When the fetus is not in the field of view, the fetal radiation dose is negligible (Table 1). The fetal dose for a CT head is 0 mGy and for a CT chest is 0.2 mGy or less depending on the trimester of pregnancy. Shielding the gravid uterus does little to reduce the radiation dose to the fetus for CT, but it is often done for reassurance.6 Concern about the harmful effects of x-rays to the fetus from CT is only considered for those examinations where the gravid uterus is in the field of view. The typical fetal radiation dose for a routine CT of the abdomen and pelvis is 25 mGy.6 With modern CT scanners that use automated exposure control the dose is about 13 mGy.7,8 Low-dose CT KUB protocols can result in doses on the order of 10 mGy to 11 mGy6 (Table 1). Intravenous iodinated and oral contrast may be given in pregnancy.1,9 Intravenous iodinated contrast is a Food and Drug Administration (FDA) class B agent. Very little iodinated contrast crosses the placenta and enters the fetal circulation. Animal studies have shown no adverse effects to animal pregnancies and no adverse effects have been observed in humans. 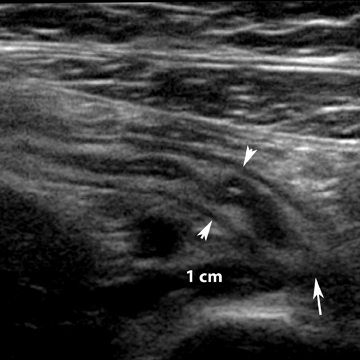 Thyroid dysfunction in the newborn has not been observed when iodinated contrast has been administered to the pregnant mother intravenously.1,3 As with all drugs in pregnancy, intravenous iodinated contrast should be administered only if necessary and after informed consent has been obtained. X-rays are a form of ionizing radiation that has potentially harmful effects on biologically living tissue. Deterministic effects are due to cell death. In the mother, deterministic effects from ionizing radiation include skin erythema, hair loss, and cataracts. They do not occur below a threshold of 1000 mGy10,11 and are not observed for diagnostic CT scans. In the fetus, deterministic effects include teratogenic effects, such as prenatal death, small head size, mental retardation, intrauterine growth restriction, and organ malformations. These teratogenic effects do not occur below a threshold of 50 mGy to 100 mGy and only occur in the first 15 weeks postconception5,6 (Table 2). Above 100 to 150 mGy, the risk is serious enough that one may discuss therapeutic abortion with the mother5 (Table 3). Since the fetal dose from a CT scan through the abdomen and pelvis is < 50 mGy, teratogenic effects are not a concern to the fetus when exposed to a single exam. They become a concern when multiple exams or multiphase exams are performed. The BEIR VII interpretation of the Oxford Survey of Childhood Cancer indicates that the background risk of cancer death in children is 0.14 % and that exposure to 10 mGy in utero increases the risk of childhood cancer death by 0.06%.13,14 In other words, there is a 40% increase in childhood cancer with in utero exposures of 10 mGy (relative risk of 1.4).12 Childhood cancer is often defined as cancer occurring before 15 years of age. According to the ACR Practice Guideline for Imaging Pregnant or Potentially Pregnant Adolescents and Women with Ionizing Radiation from 2008, exposure of the newborn child to 10 mGy of ionizing radiation increases the absolute lifetime risk of developing cancer by 0.4 % and exposure to 50 mGy increases the absolute lifetime risk of developing cancer by 2%, assuming a linear no-threshold model. 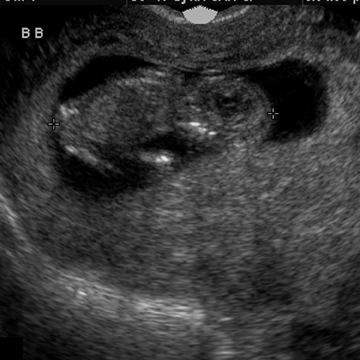 It is also assumed that this reflects the potential risk to the conceptus in utero for the second and third trimesters and part of the first trimester, although the authors acknowledge that there are uncertainties with this estimate.15 Nonetheless, the consensus is that for a single CT scan through the abdomen and pelvis that exposes the fetus to 25 mGy of ionizing radiation or less, the risk is low (on the order of 1%) and CT may be performed in patients who have a medically necessary indication. Magnetic resonance imaging (MRI) at 1.5 Tesla or less is safe in all trimesters of pregnancy. The safety of MRI at 3.0 T has not been proved and pregnant patients should be imaged at 1.5 T or less.1,9 Intravenous gadolinium for MRI is an FDA class C agent and should not be given in pregnancy. It crosses the placenta into the fetal circulation and circulates indefinitely.1,9 Although no adverse effects have been observed in humans, animal studies have shown congenital anomalies in animal offspring exposed in utero. 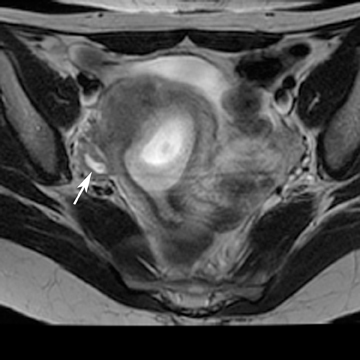 Noncontrast MRI at 1.5 T has a specific role in pregnancy. Of course, it should be used for indications where it is superior to CT. This includes certain neurologic and musculoskeletal indications. It also includes hepatobiliary indications, such as MR cholangiopancreatography (MRCP). The use of MRI in place of CT for conditions usually diagnosed with CT will be discussed in this review. 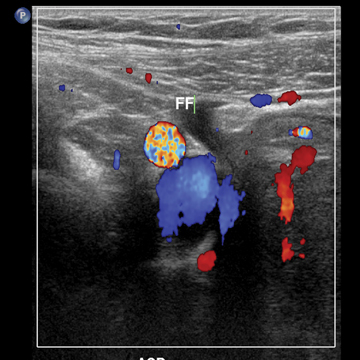 Ultrasound is performed as a first-line imaging test to diagnose appendicitis. When positive, it is a very specific test (Figure 1). 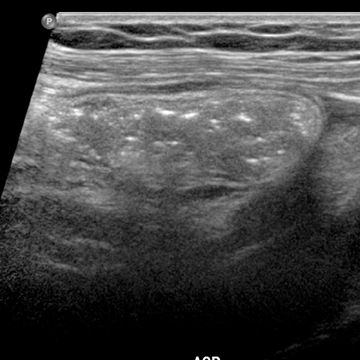 Unfortunately, in many cases, ultrasound does not identify the appendix and is nondiagnostic. Surgical exploration poses risks to the pregnancy by nature of the anesthetics. 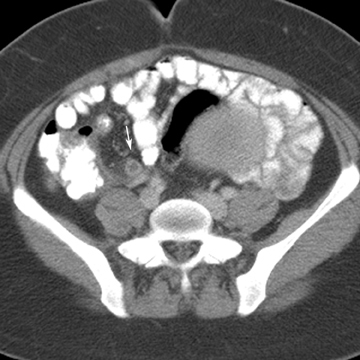 Therefore, there is a need for preoperative diagnosis of appendicitis with cross-sectional imaging. 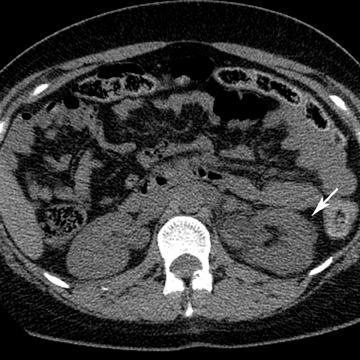 CT with oral and intravenous contrast is the most sensitive and specific test to diagnose appendicitis18,20 (Figure 2). It may be performed rapidly to expedite patient care. A single-pass CT scan of the abdomen and pelvis with intravenous and oral contrast exposes the fetus to 25 mGy ionizing radiation or less. 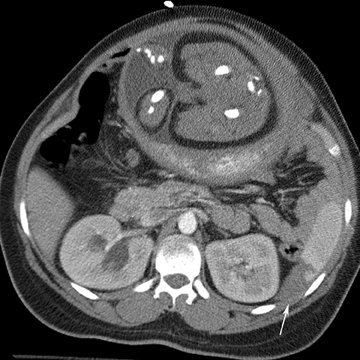 The only risk to the fetus is a small increased risk of childhood cancer (approximately 1% for an exposure of 25 mGy).15 MRI has a role in diagnosing appendicitis, particularly in the first and early second trimesters before the gravid uterus gets very large.19 MRI is most useful in identifying a normal appendix and ruling out appendicitis21 (Figure 3). 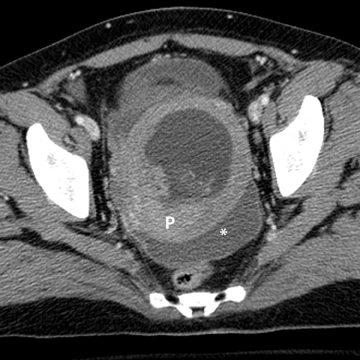 Unfortunately, the appendix is not consistently identified with MRI, and MRI may yield equivocal results. It is also unable to demonstrate small extraluminal bubbles of gas from a perforated viscus. 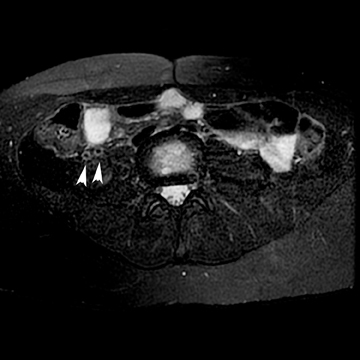 Most radiologists are more comfortable making the diagnosis of appendicitis on CT than MRI, and the time to diagnosis is much longer with MRI than CT in most radiology departments. In summary, if ultrasound is nondiagnostic and the clinical index of suspicion is high, contrast-enhanced CT is probably the next best test to diagnose appendicitis. 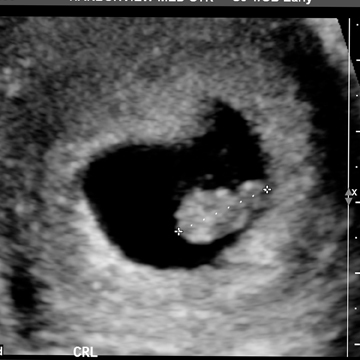 If ultrasound is nondiagnostic and the clinical index of suspicion is low, or if the patient is in the first trimester or early second trimester of pregnancy and does not have peritoneal signs, one may perform MRI at 1.5 T without intravenous contrast as the next test—provided that the MRI can be performed quickly. Informed consent should be obtained from the patient for both MRI and CT. 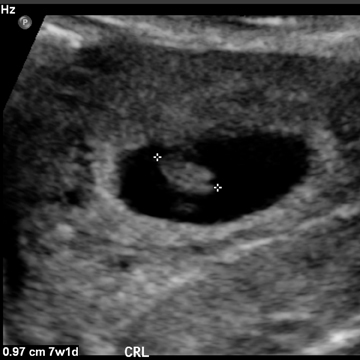 When obtaining informed consent for MRI, one should discuss the possibility of a nondiagnostic MRI and the potential need for CT.
Renal colic is the most common nonobstetrical emergency in pregnancy requiring hospitalization.9 The clinical diagnosis of renal colic is difficult in many pregnant patients. Delayed diagnosis can lead to preterm labor and infection. Fortunately, most renal calculi pass spontaneously. CT KUB is the most accurate diagnostic test for diagnosing renal colic.18,20 It may be performed without intravenous contrast. 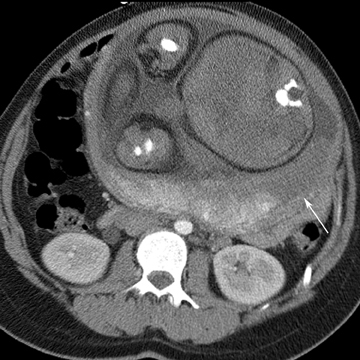 A low-dose CT KUB results in a reduced fetal dose compared to a routine CT abdomen and pelvis with contrast in the order of approximately 10 mGy to 11 mGy.6,9 If appendicitis is in the differential diagnosis, one could argue that one should perform the scan with intravenous contrast to optimize diagnosis of both conditions and avoid the need for a repeat study. 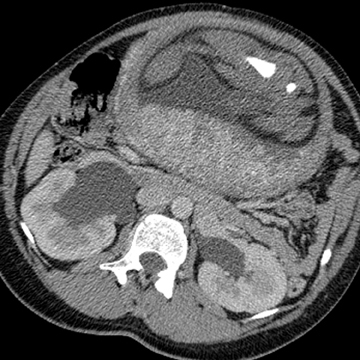 Either way, CT will identify the size and location of the calculus and the degree of hydronephrosis (Figure 5). Once identified, the stone may be followed with serial radiographs. IVP may be safely performed in pregnancy, but is rarely needed and delivers a fetal dose > 50% that of a CT KUB6 (Table 1). MRI poses the same limitations as ultrasound in the diagnosis of renal colic. It is most useful in detecting hydronephrosis. It is less sensitive in diagnosing the calculus. Time is less of a concern in diagnosing renal colic compared to appendicitis. Therefore, one may attempt an MRI at 1.5 Tesla without intravenous contrast before CT if desired. 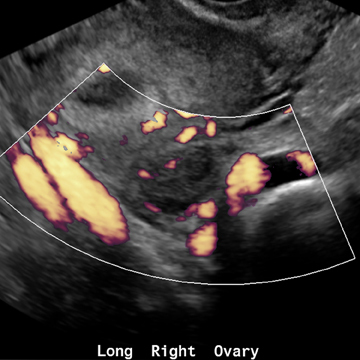 Nonobstetrical gynecologic conditions that cause pain in pregnancy may be diagnosed on ultrasound. This includes ovarian torsion, a hemorrhagic corpus luteum cyst, an adnexal mass, and a degenerating fibroid. 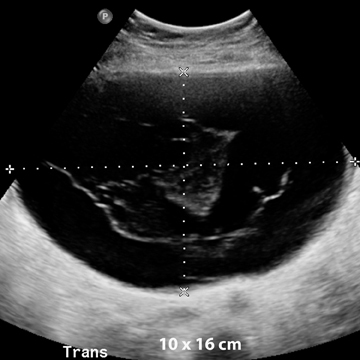 In each of these situations, if the diagnosis is uncertain with ultrasound, one may perform noncontrast MRI at 1.5 T.23 If the diagnosis is uncertain on ultrasound and the patient is unstable, for example in the setting of advanced ovarian torsion or a hemorrhagic cyst with hemoperitoneum, one should perform CT without delay to expedite diagnosis (Figure 6). Pulmonary embolism occurs with an increasing frequency in pregnancy due to the hypercoagulable state of pregnancy and venous stasis. The mortality from PE is up to 15%.9 Anticoagulation is associated with an increased fetal morbidity and mortality. The d-dimer may be elevated in normal pregnancies and is less useful in predicting the presence of thromboembolism in pregnant patients than in the nonpregnant population.9 Therefore, it is important to have an accurate diagnostic imaging test to diagnose PE in pregnancy. 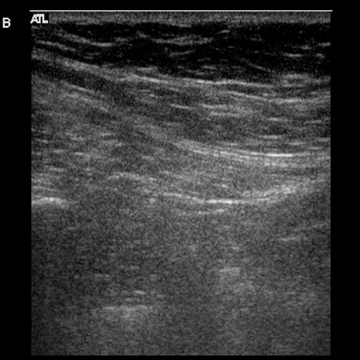 Duplex Doppler venous ultrasound is the imaging test of choice to diagnose DVT in pregnancy. CT venography is not recommended in pregnancy to diagnose DVT. CT pulmonary angiography is preferred over V/Q scanning to diagnose acute PE in the general population because of its higher diagnostic accuracy, lower frequency of inadequate studies, and ability to make alternate diagnoses, such as pneumonia (Figure 7). The ACR guidelines rate both imaging studies the same in pregnancy and advises that the ventilation portion of the V/Q scan be done only if necessary, for example, when the perfusion scan is abnormal (ACR Guidelines for Acute Chest Pain – Suspected Pulmonary Embolism in Pregnancy revised 2011). The risk to the fetus from ionizing radiation in pregnant patients is low for CTPA and V/Q scans. The fetal dose for a CTPA is 0.003 mGy to 0.13 mGy, depending on the trimester of pregnancy (the dose is greater in the third trimester than in the first trimester).24 A low-dose technique is often used for V/Q scans in pregnant patients with less radiopharmaceutical and longer acquisition times. The fetal dose for a V/Q scan is up to 0.32 mGy (0.12 mGy for the perfusion scan and 0.2 mGy for the ventilation scan). The dose for both examinations is less than the background radiation dose to the fetus for 9 months of pregnancy that is 0.5 mGy to 1 mGy.6 Intravenous iodinated contrast is an FDA category B drug and is safe in pregnancy. The two main concerns with multidetector CTPA in pregnancy are (1) the higher likelihood of inadequate studies than in the general population and (2) the relatively high radiation dose to the maternal breasts and lungs, which are both radiosensitive organs. The whole body effective dose for 16 array or higher multidetector CTPA can be as high as 14 mSv to 20 mSv4-6 (the effective dose increases with more detectors and the dose is greater in heavier women).24-26 In comparison, a 2-view mammogram results in a mean glandular dose of 3 mGy.24 The absorbed dose to the breast for a perfusion scan is 0.28 mGy.27 A CTPA exam in a young woman can result in a 0.2% to 2.2% increased lifetime relative risk of either breast or lung cancer.24-26 An added concern in pregnancy is that the breasts of pregnant and lactating women may be more radiation sensitive than those of age-matched controls.7 Dose reduction strategies are being developed in CT to limit the absorbed dose to radiosensitive organs, such as bismuth shields and automated exposure controls that reduce x-ray output when the tube is positioned anterior. In conclusion, in pregnant women with a normal chest radiograph, a perfusion scan may be the preferred imaging test to diagnose acute PE. In pregnant women with an abnormal chest radiograph, a CTPA may be the preferred imaging test to diagnose acute PE. For CTPA in pregnancy, the radiologist should utilize bismuth shields (if appropriate for your particular scanner) and automated exposure controls to minimize the absorbed radiation dose to the breasts and breathing strategies to limit the number of inadequate studies. Trauma is the leading cause of nonobstetric maternal mortality and affects up to 7% of pregnancies.29,30 Maternal death almost always results in fetal death, and the best chance for fetal survival is maternal survival. All efforts are made to save the mother. Fetal loss occurs with both major and minor trauma. When the mother survives the most common cause of fetal death is placental abruption.22,31 In high-energy trauma, such as motor vehicle crashes seen at a level I trauma center, the mother is imaged the same as the nonpregnant trauma patient with x-rays, CT, and angiography as necessary. 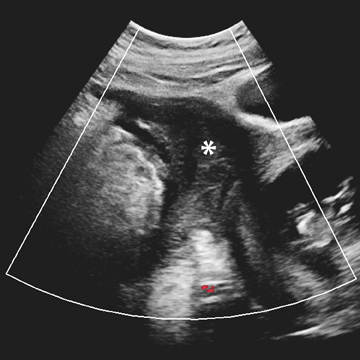 One performs ultrasound to evaluate for free fluid in unstable patients and to date the pregnancy, determine fetal viability, and evaluate the position of the placenta.32 Contrast-enhanced CT is performed to diagnose traumatic injury to the mother and may also diagnose traumatic injury to the gravid uterus22,31,33 (Figure 8). In the seriously injured patient, the mother may require several studies with ionizing radiation through the gravid uterus, and the fetal dose may exceed 50 mGy.8 In trauma patients, the total fetal dose should be calculated by the hospital physicist and recommendations made accordingly. Even in major trauma, it is the rare situation when the fetal dose exceeds the actionable level of 150 mGy when one may need to discuss therapeutic abortion with the mother (Table 3). In low energy trauma, when there is no concern for maternal injury but there is concern for the pregnancy, one performs ultrasound to evaluate the pregnancy and placenta for abruption. Ultrasound is insensitive in diagnosing placental abruption with a high false-negative rate in the order of 50% to 80%.9,10 The sensitivity of ultrasound in diagnosing placental abruption is 24%.34 The most useful and reliable test to diagnose placental abruption is external fetal monitoring with devices that measure fetal heart rate and uterine contractility.35 External fetal monitoring is employed routinely in pregnant trauma patients greater than 24 weeks gestation. Pregnant patients may experience nonobstetrical emergencies over the course of their pregnancy. A healthy pregnancy requires a healthy mother, and delayed diagnosis of emergencies in pregnancy threaten the mother and her fetus. Ionizing radiation from CT results in a potential increased risk of cancer in the mother and fetus. 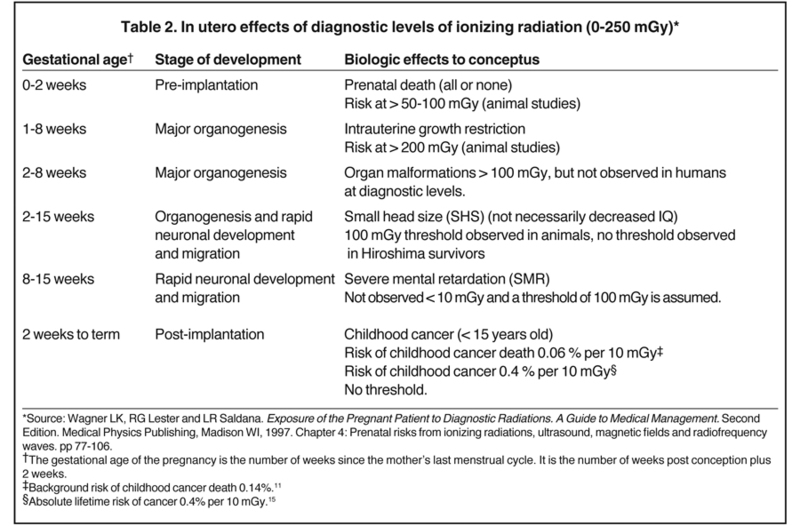 Ionizing radiation from CT may result in teratogenic effects to the fetus at high doses up to 15 weeks postconception. A CT scan that does not include the gravid uterus in the field-of-view results in negligible fetal dose and may be performed in pregnancy without risk to the fetus. 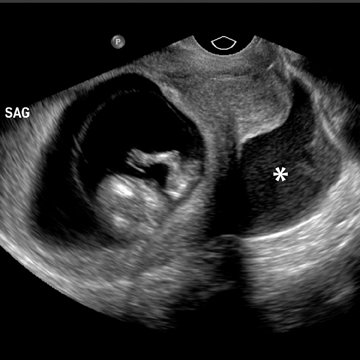 A standard single CT scan through the gravid uterus results in a fetal dose of 25 mGy or less. At this dose, there is no risk of teratogenic effects to the fetus. The only risk to the fetus is a small increased risk of cancer. Intravenous and oral contrast may be given as necessary for CT.
Chen MM, Coakley FV, Kaimal A, Laros RK, Jr. Guidelines for computed tomography and magnetic resonance imaging use during pregnancy and lactation. Obstet Gynecol.2008;112:333-340. Brenner DJ, Hall EJ. Computed tomography--an increasing source of radiation exposure. N Engl J Med. 2007;357:2277-2284. Smith-Bindman R, Lipson J, Marcus R, et al. Radiation dose associated with common computed tomography examinations and the associated lifetime attributable risk of cancer. Arch Intern Med. 2009;169:2078-2086. Berrington de Gonzalez A, Mahesh M, Kim KP, et al. Projected cancer risks from computed tomographic scans performed in the United States in 2007. Arch Intern Med. 2009;169:2071-2077. Wagner LK. Exposure of the pregnant patient to diagnostic radiations: A guide to medical management. Medical Physics Publishing, Madison, WI, 1997. McCollough CH, Schueler BA, Atwell TD, et al. Radiation exposure and pregnancy: When should we be concerned? Radiographics. 2007;27:909-917; discussion 917-908. Huda W. Review of Radiologic Physics. 3rd Edition. Philadelphia Pa: Lippincott Williams & Wilkins; 2009. Wieseler KM, Bhargava P, Kanal KM, et al. Imaging in pregnant patients: Examination appropriateness. Radiographics. 2010; 30:1215-1229; discussion 1230-1213. Patel SJ, Reede DL, Katz DS, et al. Imaging the pregnant patient for nonobstetric conditions: algorithms and radiation dose considerations. Radiographics. 2007;27:1705-1722. Huda W. Review of Radiologic Physics. Baltimore, Md: Williams & Wilkins; 1995. Buschberg J. The Essential Physics of Medical Imaging (2nd Edition). Philadelphia, Pa: Lippincott Williams & Wilkins; 2001. Bier V. Health Effects from Exposure to Low Levels of Ionizing Radiation. Washington, DC; National Academy Press: 1990. Doll R, Wakeford R. Risk of childhood cancer from fetal irradiation. Br J Radiol. 1997;70:130-139. Buschberg J. The Essential Physics of Medical Imaging. Philadelphia, Pa: Lippincott Williams & Wilkins; 2002. National Council on Radiation Protection and Measurements. 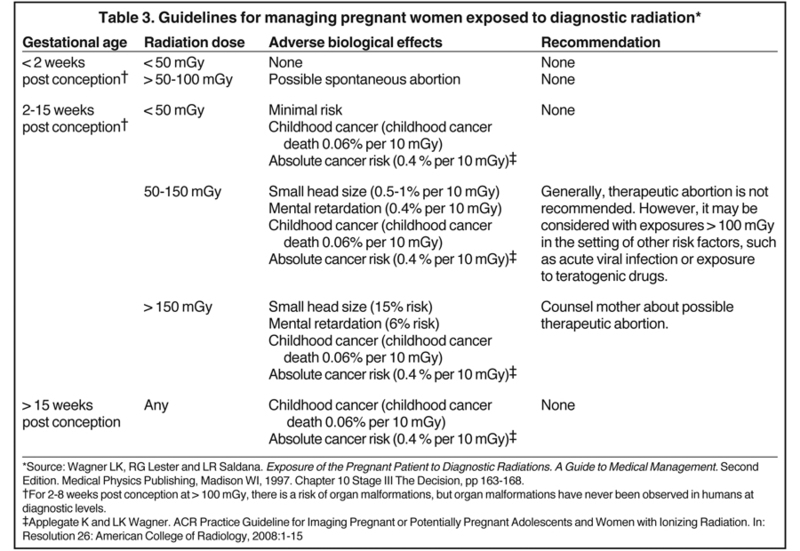 Medical Radiation Exposure of Pregnant and Potentially Pregnant Women. NCRP report no 54. Bethesda, Md. National Council on Radiation Protection and Measurements, 1977. ACOG Committee Opinion. Number 299, September 2004 (replaces No. 158, September 1995). Guidelines for diagnostic imaging during pregnancy. Obstet Gynecol. 2004;104:647-651. Acute Pelvic Pain the Reproductive Age Group. In: ACR Appropriateness Criteria: American College of Radiology. 2008. Long SS, Long C, Lai H, Macura KJ. Imaging strategies for right lower quadrant pain in pregnancy. AJR Am J Roentgenol. 2011;196:4-12. Lazarus E, Mayo-Smith WW, Mainiero MB, Spencer PK. 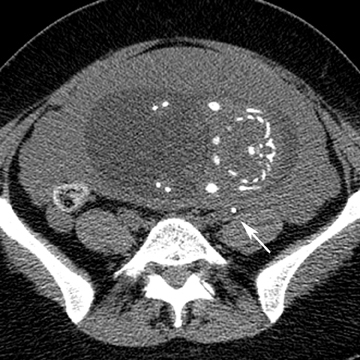 CT in the evaluation of nontraumatic abdominal pain in pregnant women. Radiology. 2007;244:784-790. Pedrosa I, Levine D, Eyvazzadeh AD, et al. 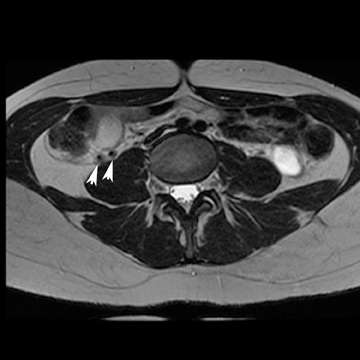 MR imaging evaluation of acute appendicitis in pregnancy. Radiology. 2006;238:891-899. Lowdermilk C, Gavant ML, Qaisi W, et al. 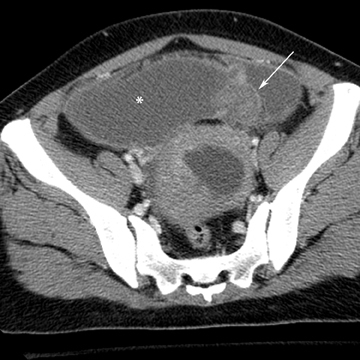 Screening helical CT for evaluation of blunt traumatic injury in the pregnant patient. Radiographics. 1999;19 Spec No:S243-255; discussion S256-258. Birchard KR, Brown MA, Hyslop WB, et al. 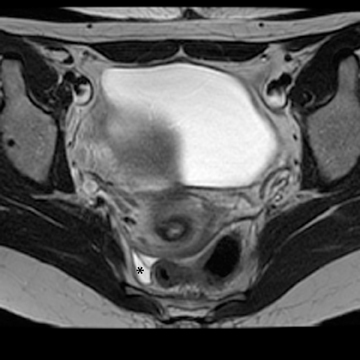 MRI of acute abdominal and pelvic pain in pregnant patients. AJR Am J Roentgenol. 2005;184:452-458. 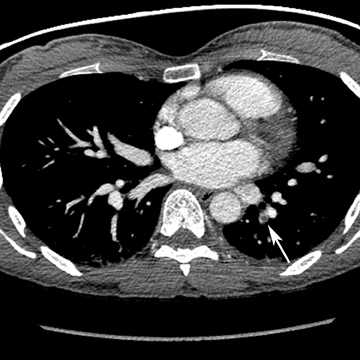 Sadigh G, Kelly AM, Cronin P. Challenges, controversies, and hot topics in pulmonary embolism imaging. AJR Am J Roentgenol; 2011;196:497-515. Hurwitz LM, Yoshizumi TT, Goodman PC, et al. Radiation dose savings for adult pulmonary embolus 64-MDCT using bismuth breast shields, lower peak kilovoltage, and automatic tube current modulation. AJR Am J Roentgenol. 2009;192:244-253. Hurwitz LM, Reiman RE, Yoshizumi TT, et al. Radiation dose from contemporary cardiothoracic multidetector CT protocols with an anthropomorphic female phantom: Implications for cancer induction. Radiology. 2007;245:742-750. Cook JV, Kyriou J. Radiation from CT and perfusion scanning in pregnancy. BMJ. 2005;331:350. Ridge CA, McDermott S, Freyne BJ, et al. Pulmonary embolism in pregnancy: Comparison of pulmonary CT angiography and lung scintigraphy. AJR Am J Roentgenol. 2009;193:1223-1227. Fildes J, Reed L, Jones N, et al. Trauma: The leading cause of maternal death. J Trauma. 1992;32:643-645. Peckham CH, King RW. A study of intercurrent conditions observed during pregnancy. Am J Obstet Gynecol.1963;87:609-624. Bernstein MP. Imaging of traumatic injuries in pregnancy. In: Course ARRSC, ed. State of the Art Emergency and Trauma Radiology, 2008:203-210. Sadro C, M Bittle, O’Connell K. Imaging the pregnant trauma patient. Ultrasound Clinics. 2011;6:97-103. Wei SH, Helmy M, Cohen AJ. CT evaluation of placental abruption in pregnant trauma patients. Emerg Radiol. 2009;16:365-373. Glantz C, Purnell L. Clinical utility of sonography in the diagnosis and treatment of placental abruption. J Ultrasound Med. 2002;21:837-840. Towery R, English TP, Wisner D. Evaluation of pregnant women after blunt injury. J Trauma. 1993;35:731-735; discussion 735-736. CT in pregnancy: Risks and benefits. Appl Radiol. Dr. Sadro is in the Department of Radiology, Harborview Medical Center, Seattle WA, and Dr. Dubinsky is at the University of Washington, Seattle, WA.